I have just done so much baking that I kind of want to lie down in a dark room, cry for a prolonged period and never bake again. However, it is Bake Off season, so do to something of that kind would be high treason against Mary Bezza and the silver fox (Mary Berry and Paul Hollywood), so instead I shall regale you with my tales of a weekend very heavy on baking. Due to the wonder that is global warming, blackberry season is upon us already. So two of my housemates and I decided this weekend would be a great opportunity for a picnic/blackberry picking expedition. We bought a load of goodies from Sainsbury's, Matt baked some apple and cheese bread, I baked cupcakes, Mike contributed cider, we loaded up my picnic hamper and set off for a local park. I had strategically packed many of our foodstuffs into tupperwares, so after a picnic accompanied by lashings of homemade lemonade and cider and a bit of frisbee, we found a patch of brambles and started picking. It was an idyllic afternoon, despite our hands getting completely ripped to shreds by briars, the boys getting bitten by insects and me having to go for not one but two "alfresco" toilet breaks behind trees. 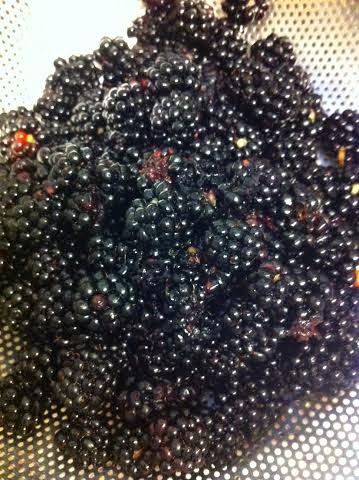 We brought back around 3kg of blackberries - so all in all a very successful afternoon's foraging. But what was I going to do with all the blackberries? We froze about 1kg, but we didn't have room to store any more without the berries going bad. Jam was one option - but we already had a half eaten jar of damson jam I made last year in the fridge, so I didn't want to make more than one jar. There was only one option - crumble. Pretty much the easiest baked dessert ever - tasty stewed fruit topped in a buttery crunchy crumb mixture. Amazing. I've never measured out the ingredients for a crumble before, so this was quite difficult and I hope you appreciate the effort I went to. I learnt to make crumble watching my mum do it, so I've always make crumble by eye. This time I measured out what I thought looked right and it turned out pretty good - in fact "the best crumble I've ever tasted" according to my housemate Matt. 1. Put aside a large handful of the blackberries and put the rest of the fruit in a large, heavy bottomed pan. Mix in the caster sugar and cook over a medium heat until the slices of apple are soft. 2. Put the fruit in a fairly deep baking dish and scatter over the blackberries you set aside earlier. Preheat the oven to around 200 C.
3. Put the flour, butter and sugar in a large mixing bowl and use your fingertips to rub the butter into the flour and sugar, making a crumb-like mixture. Spread evenly over the fruit and bake for around 30-45 minutes until the topping is golden brown and fruit juice is bubbling up around the edges. Serve with single cream. For a little added flavour or texture you could mix cinnamon, oats or granulated sugar into the topping. I know you're already speechless with gratitude at me bestowing this crumble recipe on you. But wait. I'm not done yet. After all, I still had over 1kg of blackberries left and no more freezer space. So I did make jam. It's an essential skill that goes with baking - that's why Mary and Paul are always torturing their bakers by getting them to make jam. A lot of people have problems with jam not setting. It's all about pectin and setting temperature - if you're using a low-pectin fruit like blackberries you'll have to add something like apple, which has high levels of pectin. You also will need to heat the jam to around 104 C to ensure it sets, so you may need a jam or sugar thermometer. I call this "Bramble Patch Jam" and I made up the recipe all by myself and tested it today. It's pretty good. 1. Strain the blackberries through a sieve, forcing them through with the back of a spoon so that only the seeds and skins are left in the sieve. Add the ingredients to a large pan and bring to the boil. 2. Boil the fruit for a good 15-20 minutes, skimming off any froth and bringing the temperature up until it reaches 104 C.
3. Putting a funnel in the mouth of the jam jar and being very very careful (that jam is HOT) pick up the pan and pour the jam into the jar. 4. Put a small disc of greaseproof paper on top of the jam whilst still hot and seal tightly. If you manage to seal the jam so it's airtight, it should last for months like this, even if you don't have such a pretty cover on it. This must be it, you're thinking. The gifted, beautiful Ellie is going to wrap up this blog post and leave us, bereft, until her next post. WOAH THERE. I'm not done with you get, buddy. This last recipe is inspired by crumble and completely fabricated by me. But I'm pleased with the results. half a jar of "Bramble Patch Jam"
1. Preheat the oven to 200 C and rub the butter, flour and caster sugar together with your fingertips to make a crumbly mixture. 2. Press half the mixture into the bottom of a lined, greased baking tin and spread with the jam. Don't spread it right to the edges or it will ooze out while the bars are baking. 3. Spread the rest of the crumbly mixture over the top and press down lightly to firm it up. 4. Bake for 45 minutes to an hour before leaving to cool and cutting into squares of crumbly deliciousness. And that is, I'm afraid, really is the end of my blackberry adventure, for now at least. Goodbye for now, don't forget to watch the Great British Bake Off at 8pm on Wednesday aaaand keep baking.